Communication logs are essential for successful project management. It has applications in several other fields as well, such as real estate compliance management. 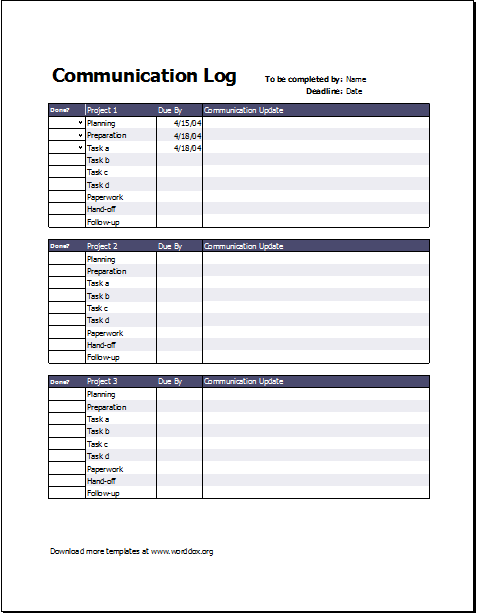 A basic communication log maintains a record of different types of communication which takes place during the course of a project. It may include phone conversations, a summary of important meetings and email correspondence. There can be linked documents with each log item. These documents can be notes taken during a meeting, budgets or permits. Communication log templates can be found on the internet. Some templates are simple while others are more detailed. The former can be used for small-scale projects. A basic communication log can be maintained for a record of calls. In this case, the included items can be the caller’s name, the time of the call and the caller’s message. It is usually the duty of assistance to maintain such logs. A template can be used as it is or modified to suit specific needs. Indeed, the availability of such templates has made it very easy to create official documents. It saves lots of time and energy which are required to create a form or document from scratch. This means you can save precious time during your working hours by availing these online templates. This time can be spent doing other important jobs. In addition, most of these templates are available for free. Therefore, no investment is needed. Finding the most appropriate template is all that is required. At times, a little customization might also be needed.